Have you been searching for a plumber local to Harwood? Thermal Heating services deal with all types of Domestic and commercial plumbing in Harwood. We provide excellent customer service, we ensure that all work that is carried to the best quality money can buy by the best professionals. Does your boiler continue to not work like it used to? 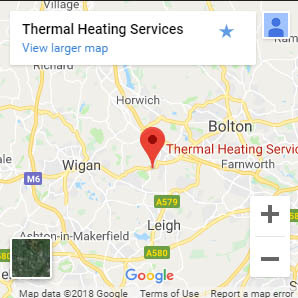 Thermal heating services offer expert boiler repairs services in Harwood. We will ensure that your life at home will be less stressful, we know the common causes of boiler faults which makes us specialist when it comes to tackling boiler repairs in Harwood. If yout boiler is showing of any of the following symptoms you may need to call and experts to assit you in resolving the issue. Are you having any of the above problems listed above, then your boiler may need a repair. For more information about boiler repairs in Harwood please. Installing central heating systems or boilers must be done by a specialist gas safe CORGI registered plumbing expert. Thermal Heating services are fully approved & gas safe for your peace of mind. Have you been looking to heat the floors in your home? Thermal Heating services offer underfloor heating installation services. We are able to install underfloor heating services for commercial or domestic use. WET Central heating systems generate heat in the floors by running hot water in pipes, the pipes carry water around the system heating the floor above the system. You won’t see the pipes at work, but the heat from the system will create a comfortable feeling on the base of your feet. The system is an energy saving application for your home heating, when comparing it to systems that involve radiators as the system works at a lower temp. want to know more about our services and pricing, you can contact us via our contact form or telephone number which you can find on each page of our website.